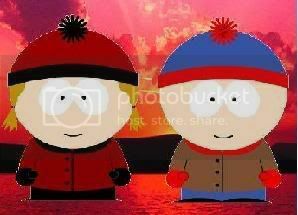 Cartman and Pip switch bodies from a bolt of lightning that affected both of thier houses. It's a common and good idea, I remember writing a fic about this once. The best thing to do is, when coming up with who to switch, either have a real story as to how it'd be good or randomize it. Plus, don't stick to just the boys- boys in girls' body and vice versa is with the price of admission anyway. Yeah, this idea is pretty universal, I don't think they would do it unless they had some original twist to add. It would be better if more people switched. It just needs a good plot to start it off, and a thin story to hold it, and a way to get everything back to normal- if you wanted to resolve this one episode. The beauty is in the scenes. Why don't the kids just switch clothes and they would get confused over who's who. We are so used to seeing the boys dressed in their regular clothes which make their characters. Imagine Kenny wearing Stan's clothes. If you don't know any better you'd think it's Stan. Unhooded Kenny wrote: Why don't the kids just switch clothes and they would get confused over who's who. We are so used to seeing the boys dressed in their regular clothes which make their characters. Imagine Kenny wearing Stan's clothes. If you don't know any better you'd think it's Stan. Yeah, but they'd figure it out. That's more of a gimmick than anything else. Last edited by KennyMcCormickRocks on Sat Nov 03, 2007 7:41 pm, edited 1 time in total. Awe come on, that's no fun. I wanna hear Craig sound all muffled-like! It'd be funny!